I’m closing in on six full years since I moved from Austin to Columbus. Because I’m a native Texan, I’ll never truly “go native” in Columbus (there’s a Natural Law of Hillbilliness that dictates that), but, with ACCELERATE 2013 rapidly approaching, it seemed like a good time to rattle off why the town is a great place to be for digital analytics. On more than one occasion, a long-time local has pointed out to me that, when talking to people from other large cities, the city name itself suffices: LA, Houston, San Francisco, New York, Chicago, Cleveland, Cincinnati. But, Columbus residents always feel like they have to provide a little more detail: “Columbus, Ohio” (it’s true!). So, with my tongue occasionally inserted into my cheek as I type, below are five reasons that Columbus is actually a great town for digital analytics! #1: Birthplace of Presidents…and Digital Analytics? Virginia is the “Mother of Presidents,” in that 8 U.S. Presidents were born there. That makes sense — it was a hotbed of colonial activism. 4 of the first 5 presidents, actually, were from Virginia. After that, though things tapered off a bit for the state. Ohio, though, wasn’t even a colony, and, yet, is the birthplace of 7 presidents. Not bad! Eric Peterson was born in Ohio, just like those 7 presidents (well, presumably, not “just like,” as some of them were born when medical techniques were more primitive). Jim Sterne put his wife through law school selling lots of software to GE and Wright Patterson AFB in Ohio. A number of major brands were founded in Columbus (and stayed), relocated to Columbus as they grew, or have a major presence here. Those companies have a wealth of consumer and digital data…and they rely on sharp analysts to help them put that data to profitable use. 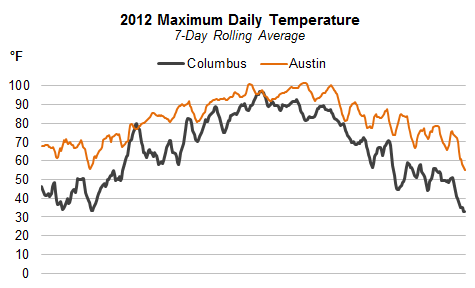 At the same time, the frigidness of Columbus in the winter tends to be exaggerated. Notice in the chart above that the temperature didn’t drop below freezing and just stay there for a long period of time. Columbus is in central Ohio, which means it’s far enough from Lake Erie that the “lake effect” that dumps snow early and often on cities like Cleveland and Detroit actually tapers out before getting down to Columbus. Climate-wise, it’s actually pretty mild. And, no, this doesn’t really directly have anything to do with digital analytics…but it did include a chart with real data (courtesy of NOAA)! IBM. Ever heard of ’em? Well, let me tell you a little story: when they decided to open a client center devoted to advanced analytics, they looked high, then they looked low, then someone said, “Why don’t you look in Ohio?” In the end, they landed in Columbus. The combination of talent, brands, and local government support made it a no-brainer (whether or not it being cooler than Austin may or may not have factored in). Digital analysts in Columbus get together about once a month to hang out, eat good food, drink good beer (except for Liz Smalls — she drinks Budweiser), and swap tips and ideas at Web Analytics Wednesday. We’ve had over 50 WAWs in Columbus in the last 5 years, and those will keep on keeping on! Seriously. What are you waiting for? Sign up now for ACCELERATE 2013 so you can check out a bit of this analytically awesome spot! Great post that I plan to use for recruiting good people to Columbus- thanks Tim!